It has been four years since the provision of CSR was introduced in the Companies Act,2013. 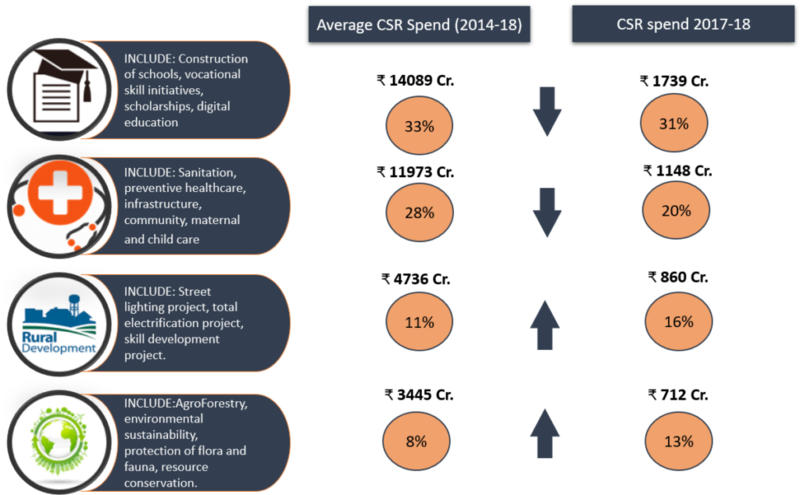 Since then, the trend in the CSR spend over the 4 years (sector-wise) has not changed much. Education and Healthcare are the two most preferred thematic areas which account for 61% of the CSR spend of companies. Education includes skilling and Healthcare includes wash, sanitation, and toilet construction. Rural development and Environment are the next favoured themes by Corporates. ₹43063 Cr. was spent by Corporates over 4 years under the banner of CSR. A key question in everyone’s mind is – Where did the money go? What was it spent on? Are there any real improvements? Déjà vu… Haven’t we heard this before? To address these questions, we present the sectoral CSR spend in 2017-18, emerging trends and CSR strategies of some large corporates. 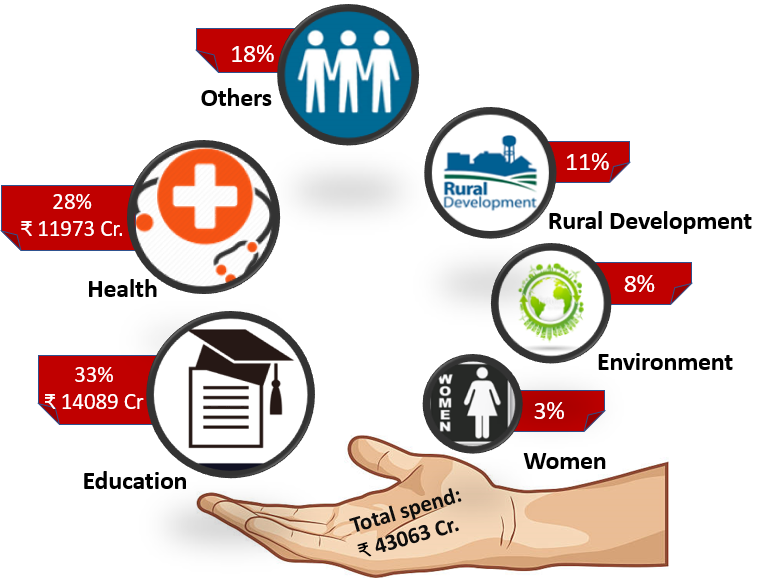 IN 2017-18, 80% of the CSR spend was in four sectors – Education, Health, Rural transformation, and Environment. In comparison with the 4-year trend, the total spend in percentage terms across the 4 sectors has remained the same but the sector-wise allocation has decreased in Health and Education and shifted to Rural Development and Environment. For 2017-18, top seven companies Reliance Industries (₹745.04 Cr. ), ONGC (₹482.6 Cr. ), TCS (₹400 Cr. ), HDFC Bank Limited (₹374.55 Cr. ), Infosys (₹312 Cr. ), ITC (₹293.81) and Wipro (₹185.66) together spent ₹2794 Cr. i.e. 25% of the total CSR spend (estimated spend 2017-18 ₹11,215 Cr.). To analyze CSR strategies of companies, we chose 50 companies. 12 PSU’s and 38 Pvt companies. In 2017-18, these companies have spent ₹6100 Cr. i.e. 54.4% of the total CSR expected spend (₹11,215 Cr.) as against a prescribed spend of ₹6606 cr. It is seen that PSU’s support more health projects and are aligned to Govt initiatives. Companies are free to choose their area of CSR; the Act does not specify any sector. However, government priorities do tend to direct companies e.g. when India was falling short of the millennial goals in 2015 to reach a near to zero open defecation status, the cause was taken up on a war footing across India as a national need/ many companies took up toilet building activity as a part of their CSR initiatives. Swacch Bharat was also treated as a national priority. Many Corporates partnered with NGO’s to promote this initiative. WIPRO has remained consistent with their CSR policy. 70 to 80% of the CSR funds are spent on education with the focus on higher education for skill building in the IT Industry. Infosys has had a change in strategy. They have moved from spending on Education to Environment. They have spent ₹206 Cr. i.e. 65% of their funds in solar energy on a sustainability initiative which has helped to reduce the per capita electricity consumption of its employees. Reliance industries CSR strategy has remained consistent over the 3 years– they have spent 60% of their CSR money on Education funding Reliance University and in Health on HN Reliance Foundation Hospital & research center (one fifth of the 348 seats are reserved to treat the underprivileged.) 24% of the funds are spent on rural development which is working with the rural community on sustainable agricultural practices, setting up rainwater harvesting and supporting water/soil conservation. TCS follows a consistent CSR pattern. It allocates 70% of their CSR funds to TCS foundation which in turn partners with Tata Trust and its focus is on health care, rural upliftment and education. ITC follows a consistent development agenda of working in locations close to their factory. Their focus areas are primary education & health which account for 50% of their CSR funds. Followed by environmental sustainability at 25% and rural development at 18% of their spend. Environment sustainability deals with social forestry promoting bamboo plantations which provide with pulpwood. They also work towards soil and moisture conservation through community-based watersheds. HDFC has maintained a clear strategy across the 3 years, which is to improve economic and social conditions of villages where it operates. 70% of their funds are spent on rural development which seeks a better life in villages by focussing on improvements in areas such as education, water and sanitation, and financial inclusion. ONGC’s strategies are aligned to the Govt initiatives and it has spent 78% of their CSR on Health & Education. It has supported Govt cancer hospitals, toilet building under Swach Bharat Abhiyan and for education, it has supported Kendria Vidyalaya’s. All their projects target empowering the weakest sections of the society. Our observation is that in some cases companies lack a clear strategy for the management of CSR funds. For example, a company with a relatively small budget of ₹1.5 to 2 Cr. has allocated their CSR budget to 10 to 15 causes listed in Sec VII. Another company with a sizable spend of ₹35 Cr. has also followed the same philosophy of spending CSR funds. They have donated relatively small amounts amongst 70 NGOs across India and the causes range from Training teachers under Education to Tiger saving under Environment with the letter “T” as the common denominator. This, clearly, will not help to deepen engagement in any one area and reflects a general tendency to maximize the spread of use of one’s CSR funds. Some of the pharmaceutical companies, which should be spending more on health care, are spending on areas such as education, sports, and environment which are unrelated areas and do not bring any expertise to the table which would have been the case had they focussed on healthcare. We need to graduate from relatively simplistic and one-time donations such as distributing school kits and books, to supporting more comprehensive and holistic interventions that ultimately assist in improving the real gaps. CSR will be benefitted when large corporates bring their strengths/knowledge to the developmental sector. Corporates should partner with NGO’s and focus on one or two interventions over a 3 to 5 year horizon. This would help corporates deepen their engagement and assess impact in a more beneficial manner. To achieve robustness in the delivery of programs, corporates should insist on a baseline and an endline report for all their projects from the implementing partners. This will help to assess the possible gaps, measure outcomes against these gaps and report them. 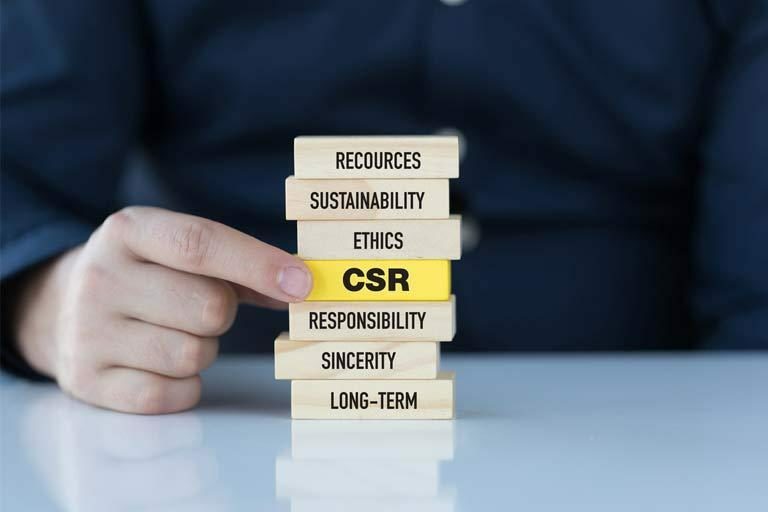 One of the key tenets of the CSR provisions was insisting on reporting and monitoring of CSR obligations, and expecting corporates to take a more systematic approach to social development, encouraging companies to look at policy, structures, processes and projects as an integrated whole instead of treating it as a formality to be followed. Investments made through Sec 8 companies should be in the interest of the poor and marginalized. This is a tacit requirement which needs to be ensured by companies while spending their CSR funds. Some individual corporates may have spent anywhere from ₹1500 to ₹2000 Cr. over the last 4 years. It is a good time to revisit some of the decisions taken, just as a review is done of business strategies, and answer these questions. Who were the beneficiaries? Did we move the needle on any front? A well-intentioned CSR strategy rolled out by an implementation strategy with sustained efforts and recording of the improvements made by their intervention will definitely enhance corporate participation in building a more equitable society.